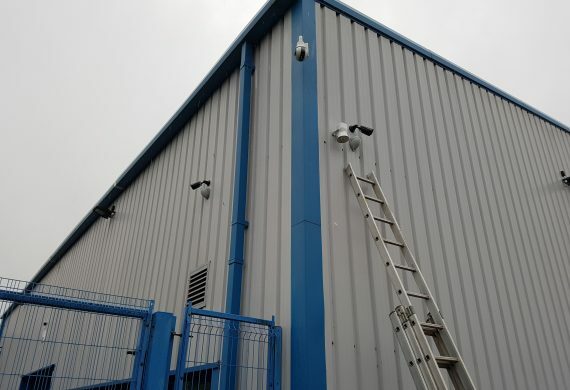 At Expo Link Alarms, we specialise in the installation of security systems for business use. Based in the North West, Asbestos Business Contractors have been trading since 2004 and successfully serve customers in a number of situations on a day to day basis. Asbestos removal and Asbestos related services are an incredibly specialised trade, meaning any disruption to a business and its offerings could severely reduce custom. The company’s headquarters in Warrington comprises of three areas – an office space, a large store room and a fenced yard. We carried out work in all three areas, meaning disruption to Asbestos Business Contractors and neighbouring businesses needed to be kept to a minimum. A large amount of time had passed since the last security system install at ABC – meaning that it had become antiquated and required upgrades to ensure the system remained effective and receptive. ABC also felt that they needed to maximise the security of their recording system by moving it from one end of their premises to the server room at the other. We at Expo Link Alarms were appointed to carry out these tasks due to our years of industry experiences and reputation as an efficient, pragmatic and reliable installations company. We used the ProLogic1 from Videcon, which drastically shortened the install time – reducing the need for rewiring the entire system – making the task a two to three hour one rather than taking multiple days. The Prologic1 was a game changer in this install, allowing us to connect the wiring to the product which in turn connected to the customer’s network after some programming. This allowed us to be unobtrusive to ABC and any surrounding businesses, and prompt with our work. Using the Prologic1 allowed us to transmit the wired GJD detectors in the system over the customers network, saving us hours on the install. Using this small and very capable product, we were able to address the issue in a few hours. If you’d like to have a security system installed at your business, or you’d like to have an old system updated, please do not hesitate to get in touch.